Early decimal mint sets were held in PVC wallets with pockets for each coin and those could easily be interchanged. 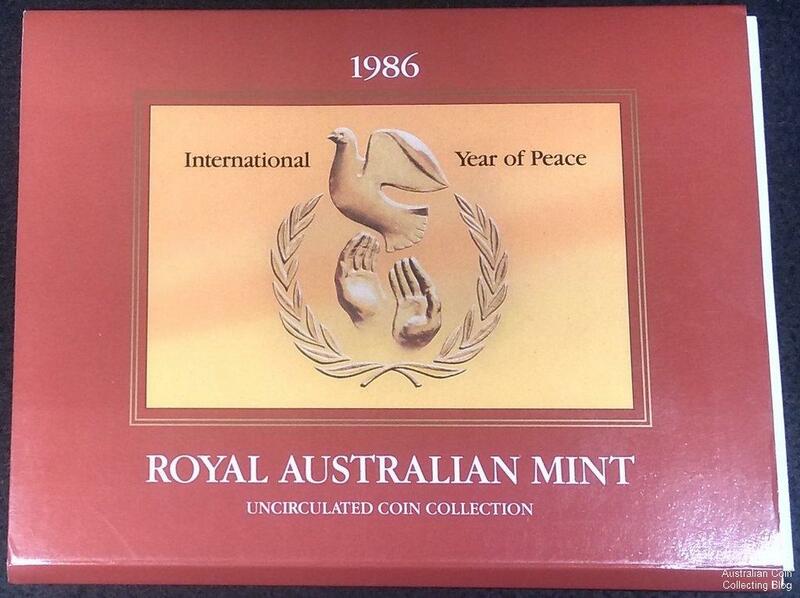 In 1984 the Royal Australian Mint moved to a bubble type of packaging where each coin had its’ own blow moulded space incorporated into a card which opened revealing the well presented coin set. 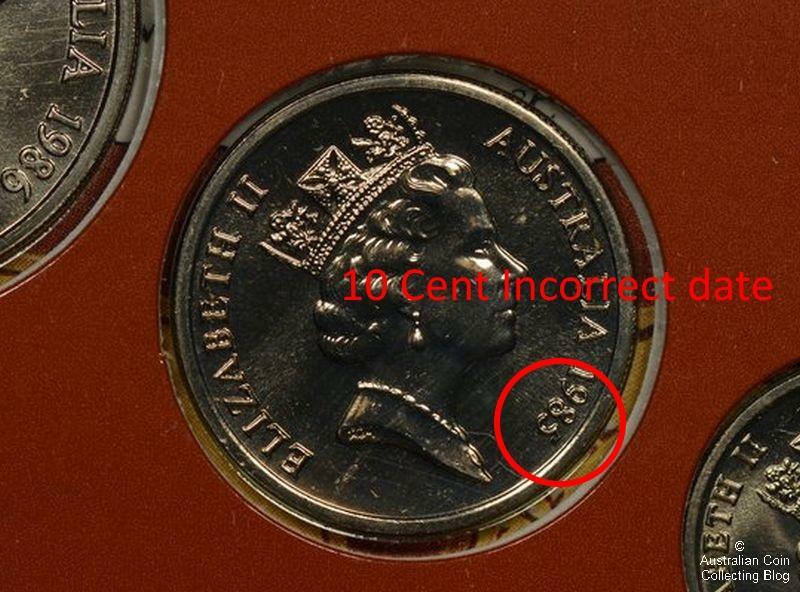 It didn’t take long for a mishap to occur with the first wrong coin in a set turning up in the 1986 mint sets. The coins should have all been 1986 dated but the 10 cent piece was from the previous year (see above). The popularity of the mint set was increasing with the Mint churning out higher volumes each year which likely led to this error occurring. Mint controller Mr J B Joslin confirmed the existence of the 1985 10c coin in the 1986 set and said the error occurred in the packing room. The error sets were first identified in mid-1986 and collectors began checking their sets very closely. Soon after it was reported that collectors returned 3 sets to Ringwood Stamps and Coins after they were upset that their new sets didn’t feature the first commemorative dollar, the peace dollar, but had 1985 Mob of Roos dollars inserted instead. Yet another packaging mistake by the Mint. Today a regular 1986 mint set might fetch $15, and the error mint set with the wrong dated 10 cent coin, $200. A much better return on the $4.50 it cost to purchase the set originally. Since that first error set there have been quite a few mishaps within the packaging room at the Royal Australian Mint in Canberra. Both proof sets and mint sets can be found with wrong coins but these are just packaging errors and don’t contain coins you couldn’t get elsewhere. If you are looking to purchase a set be sure to have a very close look at the packaging to ensure it hasn’t been tampered with to swap coins. Perhaps the the most exciting “multi-date” set is the set that contains a coin that doesn’t exist elsewhere, the 2005 proof Mob of Roos dollar in the 2006 proof set. The Outer Cardboard Sleeve of the 1986 Mint Set -what’s inside your set?